This product has reached EOL. Please contact Linx about the KH3 Series, which replaces the KH2 Series. Test the performance of the KH2 Series transmitter/encoder and receiver/decoder modules against your own design with the KH2 Series evaluation kit. It comes with two evaluation boards for benchmarking and prototyping, each of which is populated with a transmitter/encoder or receiver/decoder module. A small prototyping area gives you a place to develop circuitry. 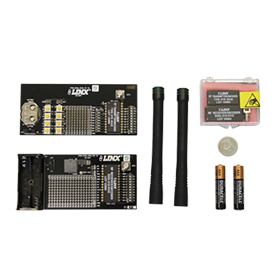 To help you get started, the kit also includes antennas, extra modules and connectors. KH2 Series transmitter/encoder and receiver/decoder modules let you trigger discrete actions with button presses or contact closures. They contain Holtek chips and LR Series RF modules. The KH2 Series provides a low level of security. It lets you send commands from multiple transmitters to distinct receivers in the same vicinity through physical addressing. Use KH2 Series modules together or with compatible Linx components for reliable one-way wireless communication at 315MHz, 418MHz or 433MHz. Compared to 2.4GHz modules, narrowband modules from Linx provide longer range and lower current consumption at a more cost-effective price. The decoder will only accept transmissions from compatible encoders with addresses that match its own. The KH2 Series allows manual addressing through 10 tri-state pins. Because the address is visible in hardware, the KH2 Series is not as secure as the MS Series and HS Series, which use digital addressing. Additionally, because the KH2 Series does not use encryption or rolling code, it does not protect against intentional security threats.